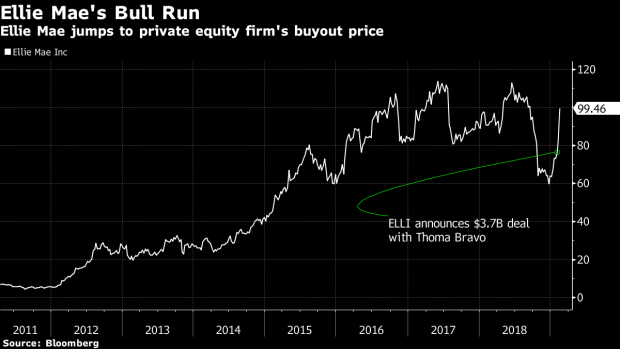 (Bloomberg) -- Ellie Mae Inc.’s $3.7 billion takeover offer from Thoma Bravo is a victory for software-focused analysts who had defended the stock in spite of criticism from many on Wall Street who didn’t believe the company would be bought for a premium price. Thoma Bravo agreed on Tuesday to pay $99 a share, 47 percent more than the 30-day average closing price, for the provider of software to help streamline and automate the mortgage origination process for lenders. Wall Street has been increasingly mixed on Ellie Mae amid a debate over whether the company should be valued for its software or priced at a discount due to its exposure to the struggling mortgage market. “The software analysts got it right” while the financials-focused analysts “missed it,” Oppenheimer’s Brian Schwartz said in a phone interview. Shares of Ellie Mae jumped as much as 22 percent to $99.60, their highest since September. Schwartz said the move reflects short-sellers who “have to get out of the stock” after staying too long in their positions. Short interest is 22 percent of the stock’s float, up from 11 percent a year ago, according to financial analytics firm S3 Partners. The takeout price represents a 6 times sales multiple, which follows the pricing pattern of other software companies -- Apptio, Mindbody and Commerce Hub -- that private equity scooped up last year, according to Schwartz. Susquehanna analyst Jack Micenko said in an interview last week that despite being “the gold standard of the industry,” Ellie’s future trajectory was tied to cyclical mortgage trends and rising interest rates. “If you think their end markets are going to decline, you wouldn’t do a levered purchase of this company,” he said at the time. This isn’t the first time Ellie Mae has tried to sell itself. In 2013, as the housing market recovered, Ellie Mae began considering a sale and interviewed banks to manage the process. Oppenheimer sees low odds that another bidder will emerge this time, given the challenges facing the housing market and the strength of Thoma Bravo’s balance sheet. Roth analyst Richard K. Baldry said in a note to clients Tuesday that Ellie’s unique positioning and strong pricing power are “likely better exploited as a private company (where such metrics need not be disclosed).” He also doesn’t expect a competing offer. He cut Ellie’s rating to neutral from buy, and the price target to $99 from $100, which is still a Street high.